Hurricane Irma, a Category 5 storm that has laid waste to Barbuda and inundated Puerto Rico, is headed for Florida. The most powerful storm ever to descend on the Atlantic, Irma has produced winds so fierce some scientists have suggested it deserves a new classification — Category 6. 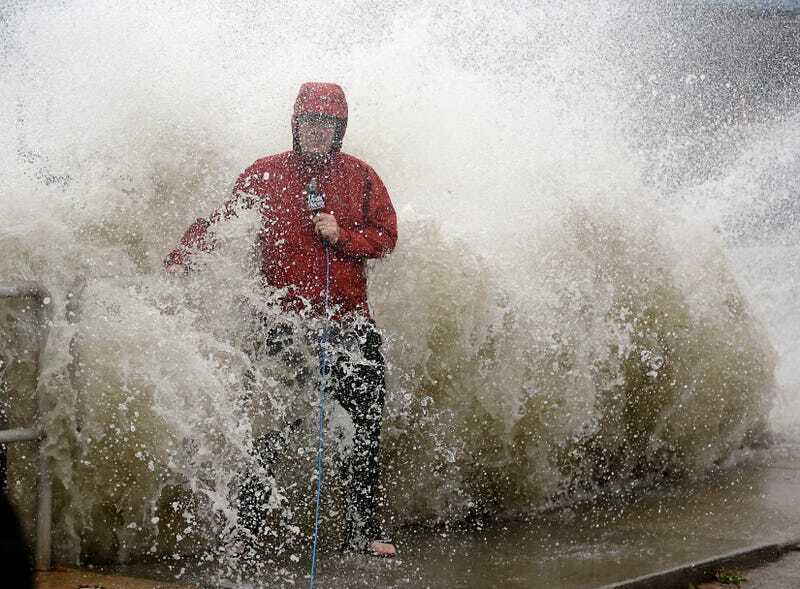 Will the major broadcast networks report on the role of climate change in shaping this storm? If Hurricane Harvey is any indication, the answer is ‘probably not.’ But by ignoring climate science, they are missing an opportunity to tell a great story. Despite the considerable evidence that human hands made Harvey more severe, climate change received limited mention in the news coverage. Some outlets — including The New York Times, The Washington Post, NPR, The Atlantic, Politico, Vox and ThinkProgress — noted the human fingerprint on Harvey. TV news programs on CNN, MSNBC and PBS also discussed the climate link. But the major broadcast networks paid scant attention to the role of climate change in the worst rainstorm in U.S. history. An analysis from Media Matters found that over the last two weeks only one of the three major networks discussed climate change. While CBS touched on the issue in interviews with experts on CBS This Morning, CBS Evening News and CBS Morning News, ABC and NBC made no mention of climate science. That’s troubling because network news broadcasts reach an enormous number of people — far more than print outlets or cable news. CNN, for example, boasts around 1 million primetime viewers. The New York Times has a little more than 2.3 million digital-only subscribers, in addition to its more modest print readership. NBC Nightly News, by contrast, reaches almost 9 million Americans every night. ABC World News Tonight is seen by around the same number. Network newscasts have huge viewership, but they are generally terrible at covering climate change. In 2016, the three major networks and Fox spent a grand total of 50 minutes on the carbon crisis. ABC, the worst offender, dedicated exactly six minutes to climate change and interviewed a total of zero climate scientists. Record-breaking storms like Harvey give reporters the chance to make climate change feel urgent and relevant. While EPA chief Scott Pruitt chided journalists for connecting Harvey to climate change, those who did so were performing an essential public service. When someone gets hit by a bullet, people want to know who fired the gun. A veteran reporter of ABC News, who asked to remain anonymous, explained that networks new outfits are wary of covering climate change because the issue is highly polarized, and broadcasters don’t want to be seen as taking one side or another. They would prefer to steer clear of the issue. At the same time, journalists ignore climate change because it doesn’t have the same immediacy as other news stories, like fights over the debt ceiling, threats from North Korea or the president’s latest tweets. The reality, however, is that climate and weather are connected, not only to each other, but also to larger issues of power, money and politics. By failing to report on these connections, journalists are selling themselves short. News outlets give an inordinate amount of attention to the horse race — the back and forth between Republicans and Democrats, the political shuffling to shore up support among voters, or the latest White House scandal. Hurricane Harvey offers a chance to cover the horse race. Reporters can discuss President Trump’s policies on climate change, Democratic alternatives, or public opinion on measures like the Paris Agreement. If news outlets don’t make more of an effort to link extreme weather to climate change, the issue will continue to be what social scientists call a quiet crisis. Despite the overwhelming magnitude of climate change, the problem flies below the radar of most Americans. It ranks lower than issues like national security and the economy. That’s partly because there aren’t regular news events that bring climate change into the public consciousness. Consider police brutality. Recent years have produced a litany of cell phone videos of police officers abusing black civilians. Cell phones turned a quiet crisis into a public controversy, drawing attention to injustice and prompting the birth of a new social movement calling for reforms. With climate change, the evidence exists, and it is abundant. But major news outlets, like NBC and ABC, are ignoring the wealth of data linking climate change to storms like Hurricane Harvey. In doing so, they are helping to keep the climate crisis a quiet crisis. Irma’s descent on Florida offers reporters yet another opportunity to connect the dots. The bullet has been fired. Reporters need to show Americans who pulled the trigger.